February and March are full of transitions. 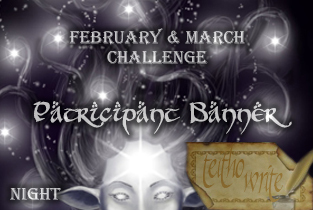 This month there are new rules here at Teitho that will take full effect, and new moderators will join the team. The long hushed nights of dim are slowly giving way to longer days, and Winter, that night of seasons, is slowly winding down. It is fitting, then, to have Night as our next theme, before Spring's morning comes. In our world, a certain night in February is traditionally set aside for celebrating love and romance. Do you think there a similar custom in Middle-Earth? If there is, how might it be celebrated? With poetry and fine dining? Perhaps with a gift of jewelry. Or is it a night for lovers who are apart to pine? (If you chose to write about more adult celebrations, please remember to include a warning for our younger readers!). Or perhaps Night could refer to a dark period of time, such as the long night after the fall of the Lamps and the death of the Trees in Valinor, or the day without dawn when Sauron's army attacked in Pelennor. There are also more practical matters to deal with during the long nights as well. How do would the Citadel guards in Minas Tirith stay warm while on duty? Do the March Wardens of Lorien find Varda's works more beautiful? Would the howling of the north winds bring nightmares to a child of the Riddermark? Night could also be a time for a ranger of the north to welcome the rest and peace that only sleep can provide. Or perhaps a long night might make a midnight snack too tempting for a hobbit to resist! Don't forget that your story can now include any character created by Tolkien. Let your mind explore all the possibilities, but don't stay up too late writing! Thank you to Thor's Hammer for suggesting the theme.